Middleton Terrace Avenue Streetscape & Street Reconstruction | Vandewalle & Associates, Inc. The City of Middleton wished to create a strong link between the Greenway Center Development area and the Downtown Business District (DBD) as part of the planning process for Middleton’s TID No. 3. The Terrace Avenue project provides that multi-modal transportation link, upgrades aging street infrastructure, and creates a public/private gathering space. 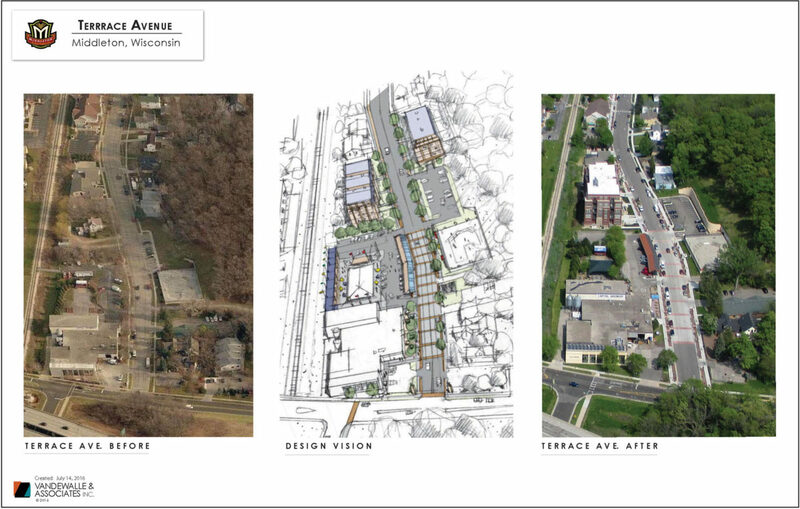 Serving as active members of the City of Middleton’s TIF Project Management Team (PMT), Vandewalle & Associates, Inc. and Strand Associates, Inc. prepared initial schematic design, design development, and final construction bid documents and specifications for the reconstruction of Terrace Avenue and creation of a large, designated public gathering space and public market canopy. Terrace Avenue contains some of the oldest utility infrastructure in the City. This project replaces water mains, storm and sanitary sewer, and undergrounded the power lines. In addition to reconstructing the street; new sidewalks, pedestrian lighting with hang- ing flower baskets and banners, clay brick terraces, and a public parking lot will be installed. 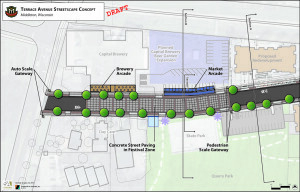 The street is designed to be a “Complete Street” accommodating all forms of transportation, including features such as bicycle sharrows, integrated bicycle racks, and a bicycle corral. 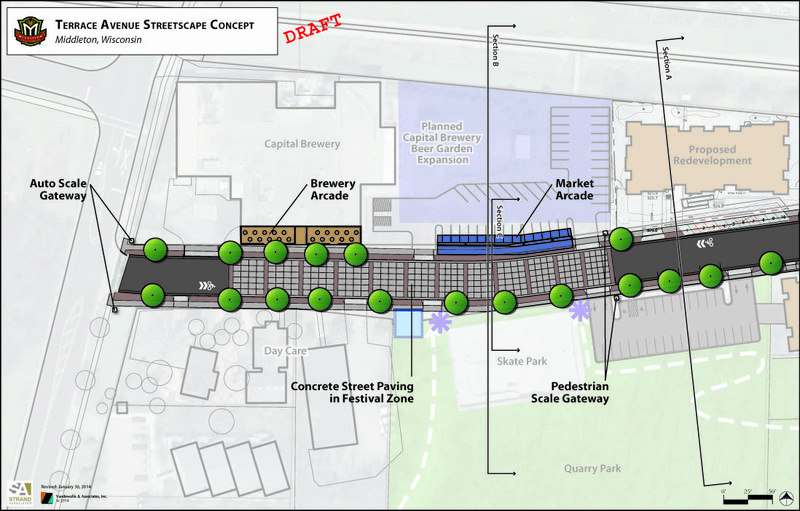 Working with Capital Brewery, which anchors Terrace Avenue on the west end of the downtown, the team proposed a uniquely flexible configuration of public market/event space, which would flank the brewery’s expanded beer garden and renovated public façade along Terrace Avenue. The combined public and private Festival Area is anchored by the Market Arcade canopy, which will be programmed for use by both the Brewery and the City for events of varying sizes–from Brewery events, to City farm markets and festivals.